If you want a high-end spinning reel that doesn’t cost a fortune, you are at the right place. If you are a fan of the Pflueger president, you’ll certainly love the new and improved Pflueger Supreme XT spinning reel. The Pflueger supreme and the Supreme XT have been around for a long time. Pflueger has taken those reels and made them even better. Read the rest of the Pflueger Supreme XT spinning reel review to find out. There are four different models of The Pflueger Supreme XT. Here is a quick comparison chart of all four of them. Size starts at 25 and goes all the way up to 40. One look at this chart and you’ll see the primary differences between these reels. But, spec wise, they are pretty similar. All of these reels provide great action, very smooth and lighter in weight compared to other models. You can literally use them all day with a nice lightweight fishing rod. 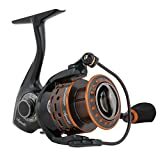 If you are looking for lightweight reels that you could use all day to catch small panfish or go for something bigger like bass fishing, you are looking at the right reels. Let’s have a look at the Pflueger Supreme XT review and go through some of the features that set these reels apart from its competitors. The body, side plate, and rotor are all magnesium, which makes the reel itself very lightweight. Probably the lightest in its class. The SP25X weighs in around 6 ounces. The 14 lb. drag capacity SP40X spinning reel weighs about 8.7 ounces. Compared to the president reel, you are shaving off 3 ounces, making it one of the more lighter reels out there. Another neat feature of having magnesium body and a rotor is that it’ll make the reel stronger. You’re looking at some durable reels right here. They are also approved for saltwater use. The Supreme Xt comes with a braid ready spool. The rubber grommets on the spool mean that you don’t have to put any monofilament backing on it at all. It’s so much of a less hassle. You just tie the braid in and spool all the way up. You don’t need to use tape to seal the braided lines. The XT comes with an additional spool in case you need one. Getting free stuff is always a good thing. The coolest feature of them all. They call it their carbon inlay drag knob design. This drag knob is a one-piece design. It uses about 30% less material than their predecessor. Pflueger also put a seal underneath the drag. That’s where the name Sealed Carbon Fiber Drag system came from. No dirt or debris will get into your drag system. It’ll give you years of quality service and that smooth drag which Pflueger is famous for. The drag isn’t too loud. I have reviewed other reels that made more noise than this one. 1. SUPXTSP25X – Max Drag 8 lb. 2. SUPXTSP30X – Max Drag 10 lb. 3. SUPXTSP35X – Max Drag 12 lb. 4. SUPXTSP40X – Max Drag 14 lb. They have also added a neat little feature which is called the “Slow Oscillation Gearing System”. What it basically means is that when the spool is going up and down, it goes a little bit slower than a traditional spinning reel. It’ll help eliminate line twist and help with line lay. The Supreme Xt has 10 ball bearings system in it or 9 bearing + 1 roller. These are corrosion-resistant stainless-steel ball bearings. It makes the reel very well balanced and smooth. They also changed the handle and made it better by adding carbon fiber. That’s right. They used carbon fiber in the handlebar to make it lighter and stronger. Because carbon fiber is 21% lighter than aluminum and stronger, the overall durability increases while the weight decreases. The knob comes with a comfortable and cushioned EVA handle knob. If you are familiar with the Stradic ci4, you’ll notice some similarities between these two. The best part of these reels is that you can work with smaller lures. You can fish all day without getting fatigued and actually have a sportier battle. Ask any Pflueger user out there and they’ll swear by it. They feel very smooth, comfortable. They are also very easy to use. Made for both left and right-handed users. 5. Comfortable knob and grip. 6. Suitable for both freshwater and saltwater. 7. Sealed drag system keeps it smooth and lubricated. By getting the right size for the right job, you can literally use it anywhere you want. Whether it’s a lake or small pond or going on a boat fishing, these reels won’t let you down. You can catch small to medium sized fish like bass, trout, redfish or crappie. Pair it up with your favorite lightweight rod or choose one from our list of fishing rods and reel in some fine species. There is a baitcaster version this model. Baitcasters are more accurate and meant for heavy fishing. I’ll be doing a review on this reel soon, in the meantime, why not check out my pick for the best baitcasters for the money. But that’s another topic. This review focuses only on the spinning reel version. Spinning reels are easier to use. They are also the most versatile reels out there. Great option if you plan on using them for medium to small fishing. There isn’t that much left to say about these reels. This line up of spinning reels by Pflueger should be kept in every angler’s arsenal. It has a beautiful finish. No misalignments whatsoever. Hope you liked the Pflueger Supreme XT spinning reel review. Let me know which model you picked in the comments below.